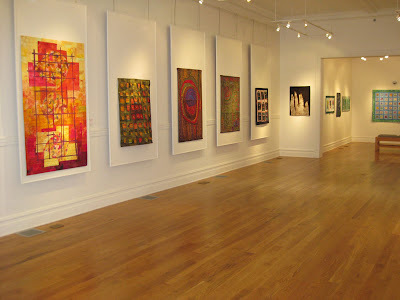 Dan and I did an overnight trip to Staunton, VA last weekend to see the SAQA Amazing Art Quilts show. It was rather unreal seeing a piece of mine hanging in a gallery. It's strange even to write those words. I hope that the photo below shows how wonderfully well the show is presented (mine is 2nd from the left). Staunton's a lovely little town and the R.R. Smith Center was a great venue to host the show. While we were there I also had a chance to reconnect with some very good friends from college. We weren't exactly disconnected, but we handn't spoken in a while and hadn't seen eachother in too many years. Meeting my friend Stacey's 12-year old daughter Zoe sort of underscored the fact that we need to get together more often. With all of the travel (and more to come), I've been struggling to get in my studio hours. I've definitely made some progress though. The quilt below (draped over the work table in the studio) is finished. In the photo the binding hasn't been completely turned, but it is really done and it's on the bed. I started this two years ago as the back of our wedding quilt. It got too good to be a back and turned into a quilt top in its own right. Who says work doesn't take on a life of its own? 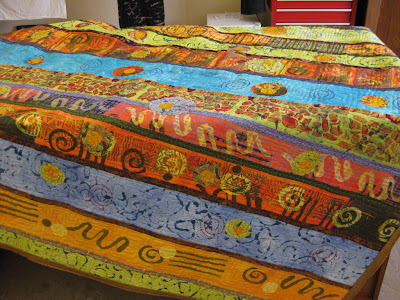 Here's the latest evolutionary stage in the "Seeds of Change" quilt. I overdyed the whole thing with sun yellow before I heat set the stenciled paint. So, the colors pop a little more, the purple is mostly subdued to brown, the paint softened in both texture and intensity and bits of color have emerged where the brighter dye colors were covered with fabric medium and resisted the yellow dye. Much improved, I think. 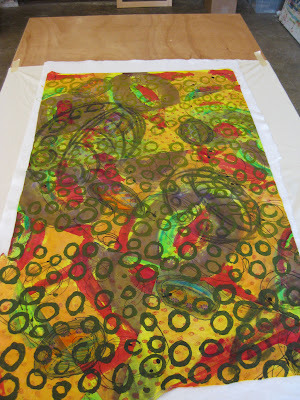 In the photo it's on the studio table getting pinned for quilting. I need to try using fusible batting. It would certainly make the quilting prep easier. The safety pins are just such a hassle. Anybody have any good advice in that department? (this is also a test to see who's listening--ha ha). I've also got about a dozen silk scarves in various stages of completion. I'm trying to build up a little inventory for open studio days. I'll try to remember to take some pictures the next time I get the studio all "dressed up". The next Artrul Afternoon at the Greenbelt Community Center is Sunday October 7, 1-5 pm. Stop by if you're in the area.